Bobby K. Marks, SHSU president, congratulates this year's winners of the Faculty Excellence Awards: Caroline Crimm, Excellence in Teaching; Beverly Irby, Excellence in Research; and Thomas Camfield, Excellence in Service. Eminently adept and selflessly dedicated to their work, their students, and their college, this year's Sam Houston State University Faculty Excellence Award winners represent the crème de la crème of the university's 500-member teaching force. Caroline Castillo Crimm, winner of the Excellence in Teaching Award, has been a history department faculty member since 1992. In addition to her scholarly pursuits in the history of Texas, Latin America and the Southwestern borderlands, the one-time high school teacher is known for an innovative teaching style that utilizes historical issues to engage students in debates relevant to their modern lives. Beverly Irby, the first woman to win SHSU's Excellence in Research Award, coordinates research for the Center for Research and Doctoral Studies in the Department of Educational Leadership and Counseling. She has been an SHSU faculty member since 1990. A prolific scholar, Irby has earned statewide, national and international renown for her research, publications, presentations, and even for a software program she developed. She is a sought-after expert in an amazing range of educational topics including: leadership, gender equity, biligualism, multiculturalism, teen pregnancy, parenting, giftedness, mathematics and science education, rural and urban education, and program evaluation. Tom Camfield, the senior tenured professor in the Department of History, is the winner of the Excellence in Service Award. He will be retiring this year after 30 years at SHSU. As a scholar and teacher Camfield has focused on social and intellectual history, but outside of the classroom his talents and generosity have been selflessly employed on behalf of the entire university community. He helped establish SHSU's first black student union, has played an active role in the three major faculty organizations, and has been an enthusiastic supporter of programs like Academic Challenge and Habitat for Humanity. "These three truly talented faculty members personify the essence of Sam Houston State University's mission to provide the best teachers, to foster creativity, and to serve as the nucleus for the cultural and intellectual development of the community," said Bobby K. Marks, SHSU president. "We are honored to recognize them and very proud to count them among the highly regarded members of the SHSU family." Caroline Crimm, winner of the Excellence in Teaching Award, said her teaching philosophy is a simple one: "to help students improve their understanding of themselves and the world around them." But within this noble endeavor lies a wondrous reward that she credits with giving her life meaning and making her extra efforts worthwhile. "When a smile crosses a face, a light comes into the eyes, excitement fills a soul, and a student says, 'Oh, I get it!' That," said Crimm, "is the joy of teaching." According to Christopher Baldwin, dean of the College of Arts and Sciences, Crimm epitomizes the real connection between the complex roles of the scholar and those of a teacher. "What sets her apart even further than most," he said, "is her willingness to convert her 'classroom teaching' from a rather lonely, private enterprise into a transparent and collegial process that welcomes student feedback and guidance as readily as the comments and input of peers and fellow pedagogists." One Crimm-engineered trick-of-the-trade that has captured the imaginations of students and faculty alike is an innovative teaching approach she calls "Dilemmas." The format requires students in all of her classes at all levels to analyze both sides of historical debates and controversies and then to make their own decision about which point of view is most accurate. "When students leap into a debate to defend their views," Crimm said, "they learn, not only about history, but about themselves." Crimm's scholarly works have explored topics such as vaqueros, the Texas Revolution, the Mexican-American War, Sam Houston, and Stephen F. Austin. She has three new books slated for publishing next spring: one focusing on the history of Mexican Americans in the Victoria area, another examining the history of the black cowboys of Texas, and also a literary biography of Texas writer J. Frank Dobie. In addition to her scholarly works, Crimm's activity in over 30 academic, professional and community organizations includes historical association memberships, student organization sponsorship, board membership and volunteer work. One word, "prolific," sums up the abundant inventiveness and productivity that defines Beverly Irby, this year's Excellence in Research winner. During her nine years on the SHSU faculty, Irby has written six books and edited five. She is founder and co-editor of the first international on-line academic journal on women's leadership issues. She has authored or co-authored research grants totaling $5 million and is one of six nationally recognized Renaissance Group Research Fellows. Irby helped develop and validate a screening instrument for gifted Hispanic bilingual students. She also co-developed an administrator appraisal system adopted by the National Association of Secondary School Principals. Her software program, "Psychometircs Plenteous: The Assessment Report Writer," is now in it's sixth edition. In addition to her book projects, Irby has published over 40 articles in refereed journals and published an additional 30 works in other publications. During her university career, she has made over 120 refereed presentations to national, state and local organizations and an additional 42 prior to becoming involved with SHSU. Irby also played an instrumental role in the establishment of SHSU's new doctoral program in educational leadership. She was the key contributor to the design of the program's research component. "The excellence of Dr. Irby's example and her continuing diverse research efforts provide a challenging role model for graduate students throughout the College of Education," wrote Karen Smith on behalf of the first doctoral cohort in the educational leadership program. "While her research accomplishments are well documented, it is the influence of her expertise and the power of her message which will impact educators for years to come." For 30 years, Thomas Camfield has held down two jobs at SHSU. As a member of the university's history faculty, his scholarship and teaching savvy have earned him accolades from colleagues and students alike. But it's his other job, beyond the classroom's call of duty, that earned Thomas Camfield this year's Excellence in Service Award. From his first year on campus, Camfield has worked continuously to improve the quality of life enjoyed by SHSU students, faculty and administrators. He has sponsored student organizations, served on the Faculty Senate, represented the SHSU faculty in state organizations, and served on numerous academic and administrative committees. He as been an enthusiastic supporter of the Texas Academic Challenge program, and has contributed significant gifts and labor to Walker County Habitat for Humanity. Camfield's extracurricular involvement with SHSU began in 1970 when the first-year history professor was called upon to be the faculty advisor for the university's first black student union -- a position he held for 11 years. During this period, he helped organize Black Awareness Week activities and assisted with the development of an ethnic studies program at SHSU. He also played an integral role in efforts to recruit black faculty and staff members for the university. Camfield was also faculty sponsor for a short-lived student art film group, "The Esoteric Visual Emporium," and has been a passionate supporter of SHSU's performing and visual arts programs. The history professor also played a vital role in the evolution of faculty governance at SHSU. As a member of the American Association of University Professors, Camfield helped secure SHSU's removal from AAUP censorship and worked vigorously to establish SHSU's tenure policy. He was among the faculty members that argued the case for an elected representative University Faculty Council and he served as a representative for the College of Humanities once the council was established. "We fought many a good fight on behalf of faculty involvement with the overall decision-making processes at SHSU and we achieved a great deal," Camfield recalled. Camfield has also represented SHSU in the Texas Association of College Teachers where he served in various offices and capacities including president. 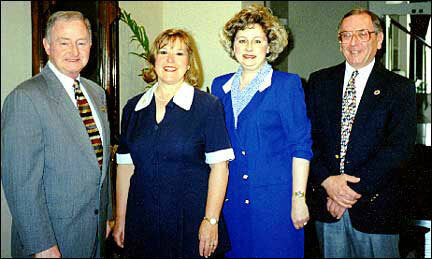 Throughout his years at SHSU, Camfield has logged extensive service on various departmental and university committees including: Academic Administrative Reorganization, Faculty Grievance, Faculty Tenure, University Curriculum, President's Political Advisory, Faculty Evaluation, Calendar, and Admissions Standards and Applications. He has served as judge and moderator for the Texas Academic Challenge, an academic competition that brings high school students and teachers to the SHSU campus twice a year. He is among the founding participants in the Walker County Habitat for Humanity, a charitable organization that provides housing for low-income families. He has also lent his financial support and time to the Community Child Care Center and has served on the board of directors of the Walker County Federal Credit Union. All three Faculty Excellence Award winners will be recognized during the May 15 commencement services at the Johnson Coliseum. In addition to the honor excellence winners receive a cash award -- $1,200 for teaching, $1,000 for research, and $800 for service.